Ever since the first iPhone was launched in 2007, various Chinese companies have been building lookalike handsets, selling them at low prices and making quite a lot of money out of it. Now, in a surprising turn of events, a China-based handset vendor alleges that the design of the iPhone 6 (released by Apple in the second half of September) “may infringe” on one of its design patents. The Chinese company that we’re talking about is Digione (so it’s not a well-known one), while the patent covers the design of an Android-based smartphone sold by the company’s 100+ brand for around $130. MacWorld has obtained a copy of the patent application, noting that the patent was granted to Digione in July. The patent is valid only in China and does, indeed, depict a device that resembles the iPhone 6. Feature-wise, the device offers a 5.5-inch display, and an octa-core MediaTek processor. Digione sent a letter to Apple on September 2, when the iPhone 6 hadn’t been officially announced (though we all knew what it would look like). The letter simply informed Apple about the possibility of a future patent infringement, inviting the Cupertino company to “communication with goodwill.” It doesn’t look like Apple responded at all, because Digione recently posted the letter on Weibo (China’s leading microblogging website) for a “chance to tell the truth.” It’s not clear if Digione will sue Apple or not, but we’re going to keep an eye on this to see how things evolve. Well, can't say I am surprised. Chinese tactic: Steal secrets from Foxconn employees, scramble to making similar looking phone, release that phone first, sue the original phone maker for ripping off their design. Yes Apple has always copied the chinese. They copied Siri from Chinese and had to pay millions to settle the matter. Looks like another copying from Chinese would land them in trouble. Chinese would rip Apple and that money monger called Cook. Apple's design was introduced with the latest generation iPod touch in 2013 (? - I don't know exactly when Apple introduced it). Or better yet, copy designs from leaks. Source? Sorry to sound like a D, but websites like PA lol. The patent was approved in July 2014, IPhone was announced in September. so the logic is right. The iPhone's front has always been looking like it is looking now. The rest of the design was introduced with the latest generation iPod touch in 2013 (? - I don't know exactly when Apple introduced it). 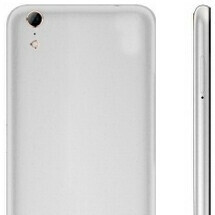 October 11, 2012 for the 5th gen.
Chineses phones use octa-core MediaTek processor and SD card slot, slim bezel. IPhone will never change. now it is the 6th generation. Apple fanboys will claim they used a time machine lol... But in all seriousness, it will be interesting to see how this goes. dubious claim and small company vs deep pockets of Apple, it won't be interesting where it'll go because it wont go anywhere, and when things go nowhere it isn't interesting at all. In China, don't count your chicks before its hatched. I'm inclined to agree with you; a Chinese company suing an American company in China? An American company that's been in the Chinese "government's" searchlights for some time? You're forgetting the HTC One M8. The iPhone 6 is s virtual clone of it. Then Apple pulls out the iPod touch and the first iphone. After that, it just buys the company and fire all the employees lol! So what you're saying is the design hasn't changed in 7 years. Samsung should buy this company and sue Apple. Are you my new personal troll? You're following me like a little puppy dude. If I feed you will you get lost?